Caiman free games: Caiman Soccer by NeoGen2 Creations. 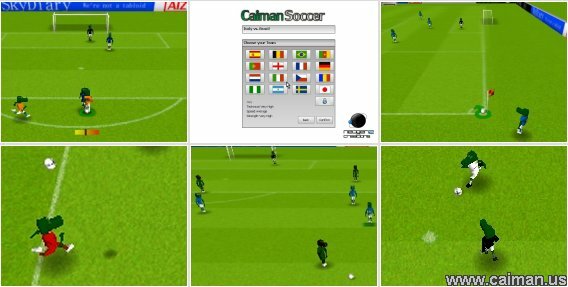 Caiman Soccer is a freeware football/soccer game inspired by games like Sensible Soccer and Kick Off, but is a new experience of it's own. The gameplay is fast paced to provide intense matches from the beggining to the end, also thanks to the highly realistic ball phyisics which even allows aftertouch. Each team has strongnesses and weakness, which makes each team unique and with characteristics of it's own. This game won the Caiman Crocodile Contest. You can use the arrows after you just shoot to curve the ball. This is called aftertouch.